When the San Francisco 49ers were established in 1946, they became the first major league professional sports team based in San Francisco. The 49ers were named after the prospectors who came to Northern California in the 1849 Gold Rush. Unlike some prospectors that went back empty handed, the 49ers became one of the most successful franchises in NFL history. The San Francisco 49ers have won five Super Bowl championships, in addition to winning their Division and Conference on multiple occasions. This franchise consists of Hall of Famers such as Joe Montana and his protégé Steve Young, Ronnie Lott, Jerry Rice and head coach Bill Walsh. Ranked as the fourth most valuable team in the NFL by Forbes Magazine, the 49ers are going through a slump lately. The 49ers are back and have their sights set on bringing another Super Bowl title to the Bay Area. Led by a highly skilled offense and a lock down defense, San Francisco is ready to take over the reigns in a competitive NFC West. Aside from battling Bay Area rival, the Oakland Raiders for county bragging rights, the 49ers will also have to defeat division rivals the Seattle Seahawks and the Los Angeles Rams to regain division superiority. Grab your San Francisco 49ers tickets and head down to Levi's Stadium to help lead your team on its quest for championship glory. The 49ers are one of the most respected franchises in NFL history. They have not only won NFL Championships, but also changed the way the game of football is played. The following games tell the story of this football dynasty. The Day the 49ers Dynasty was Born – It was January 10, 1982, the venue was Candlestick Park (the then home of the 49ers) and the 49ers were facing the Dallas Cowboys for the NFC Championship. This day and game is etched in every 49ers fans’ mind for Joe Montana’s pass to tight end Dwight Clark. On 3rd-and-3 with 58 seconds left, the 49ers were trailing by 27-21. Montana under instruction from Coach Walsh, took the snap, rolled to his right looking for his options. At first, no one appeared open, until, at the last possible moment, Montana lofted a sky-high pass to tight end Dwight Clark.Clark pulled the ball out of the air, landed firmly in the end zone and spiked the ball. The game ended with San Francisco 28, Dallas 27. The 49ers would then proceed to play in their first Super Bowl and would defeat the Cincinnati Bengals to win their first Vince Lombardi Trophy. Filling Montana’s Shoes – It was January 15, 1995, the venue was once again Candlestick Park and the 49ers were facing their perennial rival, the Dallas Cowboys. The game mattered to both because it was the NFC Championship game. The 49ers legendary QB Joe Montana had been traded by this time and his understudy Steve Young had taken over the reigns –Montana’s fans were not convinced however. This was Young’s opportunity to shrug off his doubters. He did not disappoint. San Francisco sprinted to a 21-0 lead in the first quarter on three Dallas turnovers. The Cowboys would draw to within 10 points, until Young willed his way into the end zone on a three-yard run, putting the 49ers ahead 38-21. The game ended with San Francisco 38, Dallas 28. Two weeks later, Young would throw six touchdowns in the Super Bowl, defeating the San Diego Chargers 49-26 and picking up the MVP Award on the way. The 49ers NFC West rivals are the Los Angeles Rams, the Seattle Seahawks and the Arizona Cardinals. Their other rivals are the Dallas Cowboys, the Green Bay Packers and the New York Giants. Los Angeles Rams-The 49ers-Rams rivalry was one of the greatest in the NFL. The rivalry somewhat subsided when the Rams moved to St. Louis. However, it picked up again when the franchise moved back to Los Angeles. All in all, both teams have played over 100 regular season games, in which the 49ers hold the lead. Dallas Cowboys –The 49ers-Cowboys rivalry is also one of the best in the NFL. Both teams have met on multiple occasions in the NFC Championship games and the winner has gone on to play in the Super Bowl. This rivalry has also been called part of the larger cultural rivalry between Texas and California. The 49ers as a franchise were unimpressive, till some of the future Hall of Famers made it their home. Jerry Rice –When Jerry Rice, the legendary wide receiver retired, he held every statistical record that a receiver could think of. He was also voted No.1 player of all time by the NFL Network. Joe Montana – The eight-time Pro Bowler, led the 49ers to 31 comeback victories, making him one of the best QBs when under pressure. Ronnie Lott – Lott was one of the most feared hitters of all time. He set the standards for the 49ers defense and was therefore elected as a member of both the 1980s and '90s All-Decade teams. 2013 marked the end of an era, as it was the final season the 49ers called Candlestick Park home. Their new home, Levi's Stadium in Santa Clara, is being called “the next generation of stadium design.” The $1.2 billion venue will seat 68,500 people who will get the ultimate fan experience through innovation and technology. Fans can also relive and learn about Niner history with the 49ers Museum located on the main concourse. With players like Jimmy Garoppolo, Carlos Hyde, Jeremy Kerley, Joe Staley and others, the 49ers have a real chance of making it into the playoffs this season. To watch them play at their new stadium, get your San Francisco 49ers tickets 2018 here. Our process for purchasing cheap San Francisco 49ers tickets is simple and fast. There are so many online ticketing sites, that it can be hard for customers to find the right place to buy San Francisco 49ers tickets at the cheapest price. At ScoreBig we think of our customers first and foremost. We offer daily deals for San Francisco 49ers events, so our customers can get the best seats for the best prices. ScoreBig will always go above and beyond to offer the cheapest San Francisco 49ers tickets on the market. The San Francisco 49ers schedule above, displays all available events for 2019 and 2020. Once you find the event that you would like to go to, click the red “Get Tickets” button. It is located on the right-hand side of the event listing, it will take you to an San Francisco 49ers event ticket page. ScoreBig's event ticket page will display all available San Francisco 49ers tickets for that event. On the event ticket page to help with your search for the right San Francisco 49ers tickets, use the filters at the top to select quantity, price range, and more. There is also an interactive seating chart so you can pick where you want to sit. When you are ready to buy a ticket, click on the listing, and you will be directed to ScoreBig's checkout page. Upon completion of the information fields, your order will be processed and your San Francisco 49ers tickets will be delivered via email, mail, or to your mobile device. What makes ScoreBig’s site stand out from the rest? We are constantly analyzing our competitors to improve our site, service, and prices. ScoreBig.com employees strive to offer the best process and experience to buy cheap San Francisco 49ers tickets. Our goal is to get you the best seats to San Francisco 49ers events. We offer daily discounts on our site and for special promotions check out our newsletter. If there are no San Francisco 49ers events currently available, you can use our search feature at the top of the page to see a list of all popular events going on near you. No matter your price point, we have all the best deals and discounts on San Francisco 49ers tickets. For more information on prices of San Francisco 49ers tickets and the schedule for San Francisco 49ers, check out our listings above. The last thing you want to find out is when the San Francisco 49ers event you wanted to go to is sold-out. Don’t worry in many cases ScoreBig has affordable tickets to sold out events. We sell tickets from GA all the way to premium seating and parking. Skip the scalpers in the parking lot and get your tickets online from top San Francisco 49ers ticket brokers. We get you in all events, buy your San Francisco 49ers tickets here from a brand that many trust and rely on for all their ticketing needs. ScoreBig offers a 100% money-back guarantee. If you have been in search of cheap tickets for San Francisco 49ers, ScoreBig by far is the best option. That’s why ScoreBig has more loyal customers than any other ticketing site. 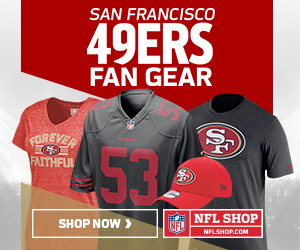 Shop at ScoreBig for safe and secure San Francisco 49ers event tickets.